Michelle Hough, Communications Officer for Caritas Internationalis, shared her interview with Cardinal Luis Antonio Tagle of Manila, president of the international Caritas network. 1. The Pope gave you a big hug when he saw you on the stage after he arrived at WYD. What’s the Pope like as a hugger? (Laughing) He’s a gentle hugger. The hug is a hug of a father, but also of a friend. When he hugged me on the stage during the opening ceremony he said ‘Here he is!’ – a hug of recognition – and then he said, ‘Ma questo ragazzo, you should be there (in the audience) with the young people and not here with the cardinals’. 2. When you were introduced to Pope John Paul by Cardinal Ratzinger, referring to your youthful looks the future Pope said, ‘Don’t worry, he’s made his first Communion’. How come you still look like a youth? I think I don’t take myself seriously, I take the Saviour seriously. There is such a great love in the one who died for us that just the thought of that should make us so joyful, energetic and hopeful. 3. You sang the song ‘Where is love?’ from the musical Oliver! following Caritas’s youth gathering the other day, do you know any other show tunes? I grew up surrounded by music and every occasion reminds me of a song like when I saw #CaritasYouth the other day. I had no plans on referring to that song but when I saw all the young people it came back to me, ‘Where is love?’. When I was talking about opening ourselves to mercy to a crowd earlier this week and I thought about pride and how we sometimes say emphatically ‘I can do it my way’ Frank Sinatra’s My Way came to mind. It’s not Jesus’ way, I’ll do it MY way. The people in the crowd of my generation knew the lyrics and were dictating them to me…These songs, the lyrics are good and they allow us to write our own words to continue the song and the melody. 4. 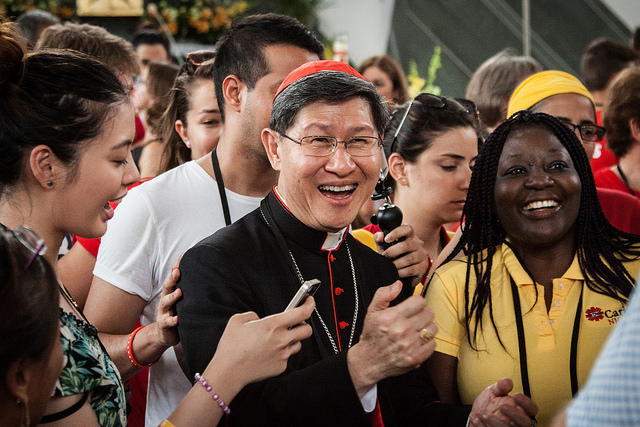 Have you cried yet at World Youth Day? Yes – in every catechesis! (laughs). I don’t know, it’s not part of the script, it just comes. During the Stations of the Cross (with Pope Francis) there were moments where we just had to cry not only with, but for the many people who are crucified. 5. What’s the hardest question you’ve received from a young person during the catecheses you’ve done over the past few days? The questions of the youth are real questions. They’re about life and they can even be called metaphysical, but they’re framed using very simple and innocent terms. One of the most difficult questions was, ‘How do we forgive terrorists?’. There I was confronted with the folly of the cross. We have to beg God for the grace to do this. We turn to stories, to Jesus who forgave not just terrorists from outside, but his own friends who betrayed him. Then you go to the story of John Paul II who even visited the man who tried to kill him..then you know it’s real, it’s not theoretical, you’re not talking about terrorism but coming face to face with a terrorist. That’s where the story begins. 6. Horrific crimes against humanity (at Auschwitz-Birkenau) took place not far from where WYD is being held in Krakow. How do we forgive without forgetting? I am a firm believer that you don’t need to forget in order to forgive. In fact remembering might help us forgive. Remembering first the horror of these crimes and that we make a commitment to never allow that to happen again and to never participate in any horrific action. We also remember, not only the victims but also the perpetrators who are also made of dust, like us. Like them, we are all sinners. So in the mystery of sin and failure, we are brothers and that’s why God can be forgiving because God always remembers we’re made of dust and we have to be picked up again and again. I think we need to condemn horrible acts of terror. In fact, we need to hate terrorism. We need that strong feeling. But at a certain point we need to hate hatred itself. 7. What resources do Polish youth have to face the future? I really admire the tenacity and strength of the Polish people. I think every generation of Polish people should cherish this legacy of love and country and of culture, love of the earth and of their identity. They should discover over and over again the secret of this strength and they should treasure it, make it grow and pass it on. 8. 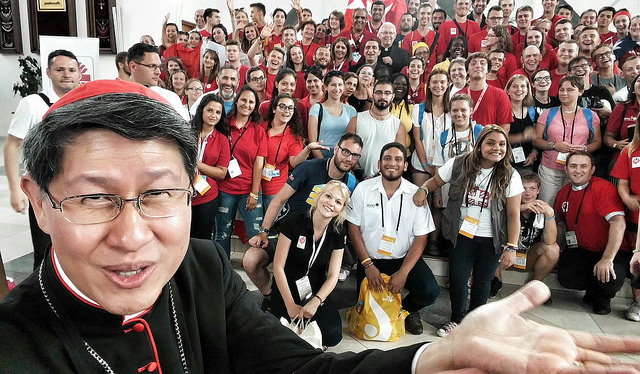 How many selfies have been taken with you at World Youth Day? (Laughs) I don’t know! I think for the young people it’s a way of being present with them. It’s their way of connecting with you. 9. You have a very busy schedule. Do you ever want to just go home, put your feet up and have a cup of tea? The one thing I miss terribly is just being by myself and being a regular person, but it’s becoming much more difficult to do that even at home. People think that I’m an extrovert and I know how to handle crowds but I’m really an introvert and very shy. But for me it’s a mission. 10. One sentence on what it means to be young? Being young is a grace, it is a gift, and it is a gift to be shared.